Convert any HD videos recorded by Canon, Sony, Panasonic and other devices. Support Apple ProRes/DVCPRO/HDV/Avid DNxHD/AIC codec. Deinterlace and reduce image noise to keep better quality. Transcode AVCHD, MTS, M2TS, MXF, XAVC, XAVC S, TiVo, MOV to any formats. Convert HD files for editing in FCP X/7/6, iMovie, Avid, Sony Vegas, FCE, AE, Premiere, etc. 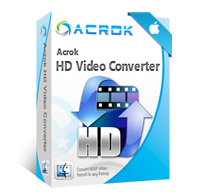 HD Converter for Mac, easy to operate Mac HD Video Converter, which enhances your experiences on enjoying HD videos on players, since this HD Converter for Mac can convert HD video, like MXF, XAVC, XAVC S, TiVo, AVCHD (MTS, M2TS), HD TS, HD MPEG, HD WMV, HD MPG, HD MP4, QuickTime HD MOV, HD H.264, HD RM video, etc. Let you edit any video in Final Cur Pro (FCP X, FCP 7, FCP 6), iMovie, Premiere Pro (CS5, CS 6), Sony Vegas, FCE, AE etc. And you can convert HD video (AVCHD, MXF, XAVC) to common video for playing on tablets, HD media player, Smart TV and etc. HD Converter for Mac also owns the solution to HD video to HD video, convert SD(Standard Definition) video to HD video, or SD video to SD video conversion. HD Converter for Mac could convert HD video to HD video, HD video to SD video, and SD video to HD video. This Mac HD Video Converter owns the solution to convert audio files and extract audio from video files. You can crop the video play region and remove the black edges easily and get any playing area of the video by using its “Crop” function to perfectly fit your player. This HD Converter for Mac owns the ability to finish diverse output formats conversion at one time to save your time and work. With HD Converter for Mac, you can adjust output video Brightness, Contrast, Saturation and Volume. Checking Deinterlacing is to convert interlaced video to the progressive one to avoid mosaic. With HD Converter for Mac, you can easily snapshot your favorite picture while you are previewing the video.